While the aircraft carriers of Imperial Japan may have captured the glory of the navy's early victories in the Pacific, by and large it was her cruisers that did the slugging, round after round, with the U.S. and Allied navies during the initial stages of the war. This latest New Vanguard edition by Osprey Publishing chronicles the development and use of Japan's heavy cruiser force. All 18 of the heavy cruisers (designated "Class A cruisers" in the IJN) that fought in the Pacific War were completed before the outbreak of the war. No Japanese heavy cruisers were built during the war. 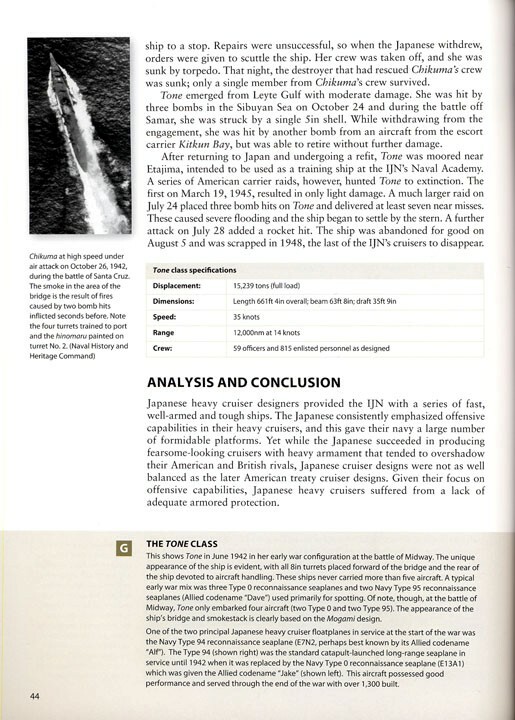 The introduction describes Japanese naval strategy and defines the Japanese Navy's notion that each of its vessels be designed to out sail and out gun any similar U.S.N or Royal Navy opponent. In that respect, their cruisers were initially designed to carry maximum firepower on the smallest possible hull, while in theory at least, staying within the tonnage limits imposed by the Washington and London Naval Treaties. As described throughout the text, they more often than not failed to stay within those limits, often with disastrous results that required extensive rework. However, by 1941, the IJN had a heavy cruiser force of 18 powerful vessels that would spearhead naval attacks on several Pacific battlefronts. Tables throughout the narrative describe various aspects of each vessels armament (main, secondary and light AA), radar, construction timetables, class specifications, etc. Also included is a sidebar that highlights the source of each vessel's name (e.g. : Atago - named after a mountain near Kyoto). 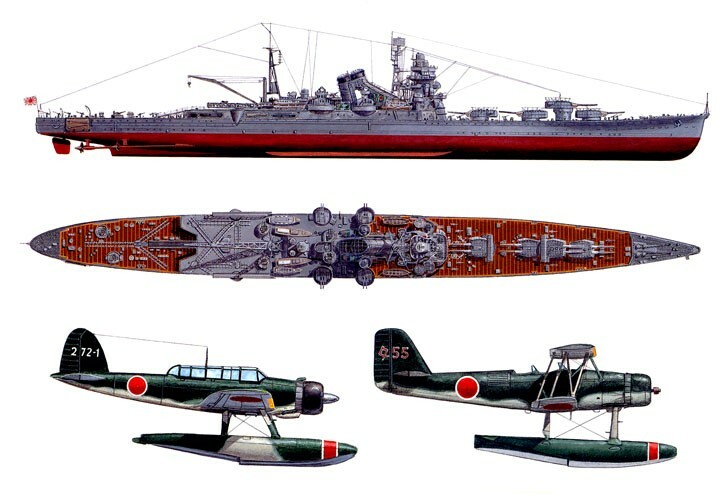 Illustrations include a full-page profile and top view of each class, a two-page cutaway spread of the Takao and two illustrations of Chokai and Kumano at sea. 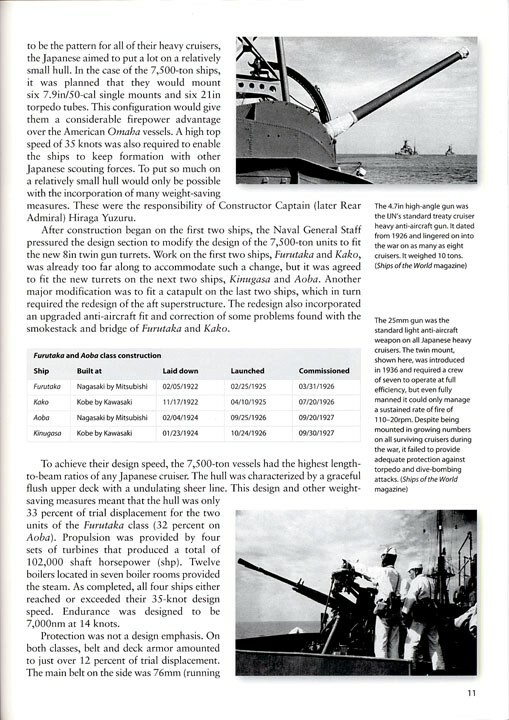 Although photos of Japanese vessels are somewhat rare, a good selection of black and white images is spread through the book, including a few good "on deck" shots showing closer views of shipboard equipment. A great deal of information has been packed between these covers, and with this latest New Vanguard edition, Osprey has produced one of the most comprehensive guides possible within its short 48 pages. Highly recommended. Thanks to Osprey Publishing forand IPMS/USA providing me with this review sample.